CONNOR COYLE makes his long-awaited return to the ring on Saturday night, televised live on UFC Fight Pass, and the Derry puncher is hoping the priceless exposure will open more doors for him Stateside. Putting his perfect 8-0 record on the line in a 10 rounder against American, Travis Scott (19-4-0), the Galliagh man headlines the event co-promoted by Roy Jones Jr. Promotions and Rite Hook Promotions at the Coliseum in St Petersburg, Florida. It’s Coyle’s first outing of the year following a ‘stressful and frustrating’ end to 2018 but, having fully recovered from injury, he’s delighted to get back to doing what he does best. “The fight is the main event on UFC Fight Pass so it’s massive exposure for me and an opportunity for me to showcase myself in front of millions of viewers. This could be a big door opening for us,” he added. “It’s been a stressful and frustrating end to 2018 after I was diagnosed with Lymes Arthritis. It held me back from one or two big fights. But I’ve been treated and cured by Enda Masterson from ‘Master Health’. Despite his inactivity since his TKO of Danny Pastrana last June, Coyle believes his fitness levels are at their peak and he’s prepared for the biggest test of his pro career. “We’re building my career at the right pace, and not rushing into anything too big, too soon. We think this is a great fight for us, especially with the experience this boy has. 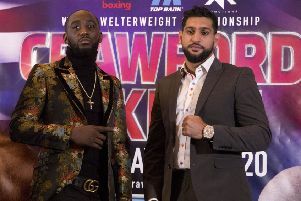 “He will be a very difficult fight as he is a negative fighter, a slick counter-puncher, but we’ve put the work in this camp, and we will be ready for anything that comes our way. Connor Coyle looks to stretch his pro record to 9-0 in Florida on Saturday night. The ground work was put in while back home in Derry with his former amateur coach, Cahir Duffy and the team at St Joseph’s ABC in Galliagh and his camp was taken up a level with sparring at his Florida base with Hall of Fame coach Jim McLoughlin and John Vinciguerra. And Coyle is grateful for all the help he’s had in getting him back to the top of his game. “I’m very excited to get back into the ring and get going again. Once this fight is over, we will be looking on to another fight in April and I’ll have more details on that to come after Saturday night. “I’d like to thank my whole team at home who are always there for me no matter what, since I was 12 years-old, Cahir Duffy, Kevin Duffy, Liam McLaughlin and all the lads of St Joseph’s Boxing Club. The 28 year-old middleweight has made huge sacrifices once again for the good of his career and having missed his daughter Clódagh Rose’s birthday for the second year in a row, he’s hoping to dedicate his win to her. “I’m missing my daughter Clódagh Rose’s third birthday! This is the second birthday now I haven’t been able to be there for her, but I’ve been speaking frequently on Facetime, and that does help. “I know she’s had a great time, as Ashleigh (her mum) has put together a great party for her on Sunday and I’ve spoken with them over the phone. I will be home on Monday and I can also have my party time with her. I’m sure she wouldn’t complain having a couple of birthday parties,” he laughed. Coyle has been accompanied on his trip by his girlfriend, Eva who will be at ringside on Saturday night and her presence has made things run a lot more smoothly. “I’d like to thank my girlfriend Eva who has repeatedly supported me through the good times and, more so, through the worst of last year. Coyle would also like to thank the following sponsors: Classique Floor Designs, Paul’s Butchers, G&K Contracts, The Metro Bar, The Bentley Bar, S.Co and James McClean.